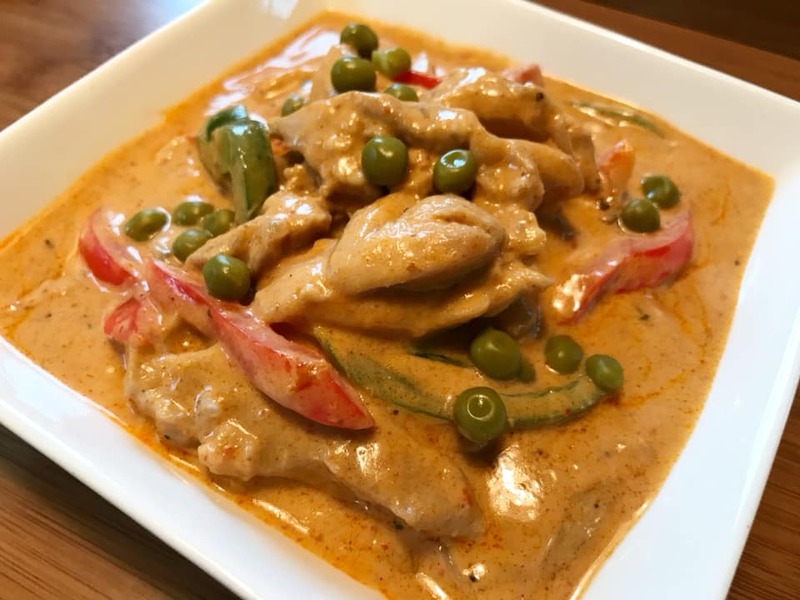 Panang Chicken Curry is one of my favorite Thai food. Why order take out when you can make it from home and adjust the taste to your liking. It is easy to make and taste as authentic as the one made in Thai restaurants. I think the most important part of this delicious dish is the sauce. You can also substitute the chicken with beef, shrimp and even fish or vegetables. 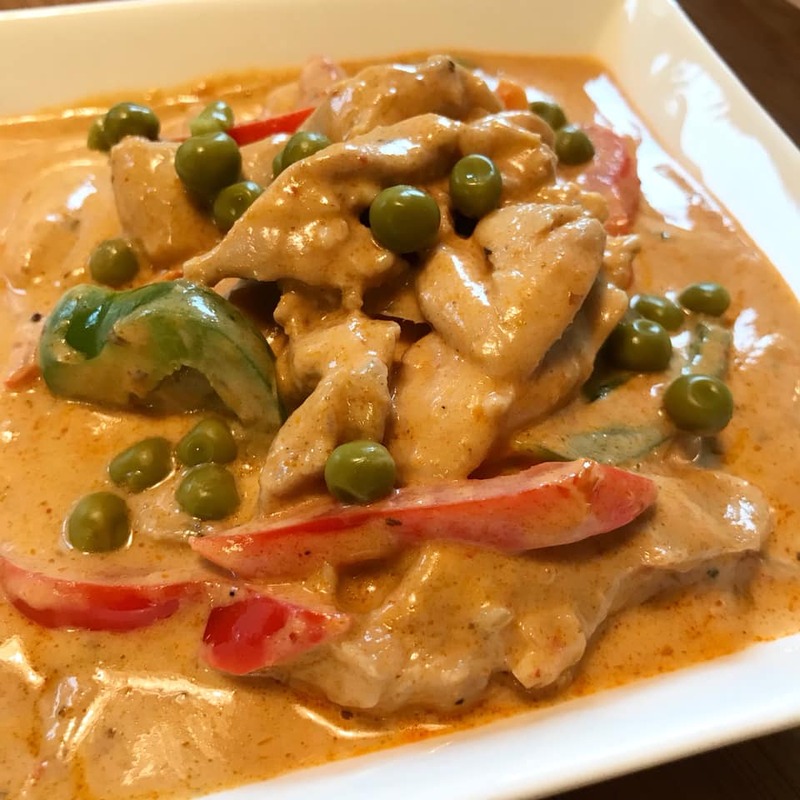 Panang Curry is a red Thai curry that is spicy, rich, creamy, salty and sweet. Panang Curry is one of the Thai Curries that has a strong influence from Indian curry. Adding ground roasted peanut or peanut butter to the recipe makes the curry thicker and creamier. Panang Curry Paste is available at Amazon or at local Asian grocery store. My favorite brand is Mae Ploy (picture below). You will only need few tablespoon or more if you like it super spicy and keep the rest for later use. I transferred the left over curry in small Ziploc Bags, labeled and freeze to keep the freshness. Heat wok or a skillet over medium heat and add coconut oil. Add chicken to the wok. Stir and cook for 5 minutes. Remove chicken and set aside. Using the same wok, add onions and garlic. Saute for a minute or until fragrant. Move vegetables to the side and add panang curry paste and saute. Add peanut butter and stir. Cook for a minute or two. Add kaffir lime leaves and stir. Add fish sauce and coconut milk. Stir to blend. Add cooked chicken to the wok. Stir and bring into a quick boil. Lower heat and simmer for 15 to 20 minutes or until the chicken is fully cooked and the sauce thickens. Stir every few minutes. Remove the wok from heat. Add basil leaves and quick stir. Transfer in a serving plate and serve hot over steamed rice. Enjoy.